In my previous post, I mentioned the responsibility of deciding when to transform a virtual prototype into a physical prototype. I may have been a bit premature having this discussion with my readers. As you may be aware, there is a great deal of hype – surrounding “desktop printing” and I may have jumped on that bandwagon a bit hastily. This technology has been around for decades. True, some very industrious individuals brought this technology main stream by offering desktop printers within a price point of a personal computer. However, before you get to play with this new toy, you must have a “solid model”. While there are many tools to create solid models, engineering or designing a solid model is a very different undertaking. Before you consider going to a physical prototype, a clear understanding of the problem at hand is critical. For the engineer, this understanding is in the form of a specification document. Preparing and formulating a thorough specification requires capturing a client’s ideas, requirements and desires into a set of boundary conditions describing a system to satisfy their needs. It is up to the engineer to truly listen to an innovator’s visions and resolve them into a specification document.. 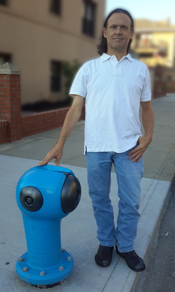 The image above is the prototype of the Sigelock Systems vandalism proof fire hydrant. Developing a specification document can be daunting. Do you think I am overstating this effort? I am immediately reminded of a client Adept helped several years ago. This client is an excellent example of a consultant’s worse nightmare and dream client all wrapped up in one package. It was early in the morning, my phone rang and a gentleman introduced himself as George Sigelakis, a retired firefighter. He proceeded to passionately explain his idea for a revolutionary fire hydrant. The invention sounded like it might have merit. With genuine interest, I sat up in my chair and began to listen. He explained he worked with several other engineers and began making prototypes. While the prototypes were really close to what they needed, there was one problem, they don’t work!? An installed Sigelock Fire Hydrant. At that point, I began to explain my methods and what I think needed to be done. I was very direct and perhaps ended the phone call a bit prematurely. Fortunately, a week or so later, the phone rang and it was the same gentleman. He also felt our discussion was too short and called back to set up an in-person meeting to further discuss options together with his investor. This meeting revealed hand drawn prints, and miscellaneous parts along with a more detailed explanation of the vision at hand. There was no doubt this group was working on this project for several years and determined to bring this product to market. However, it was also immediately obvious the existing design did not meet their requirements. After hours of explanation and discussion, the client seemed assured I knew what I was talking about but still was not clear on why their design wouldn’t work. Concluding the meeting, I said I would analyze their existing design and prepare a report diagnosing the designs possibilities. They agreed. After reading the report they decided to ask Adept to provide a product redesign proposal. Understanding a client’s needs is paramount to the success of any project. Fortunately George Sikelakis, the inventor of the Sigelock Systems, had a clear and precise vision of what his hydrant needed to be. Armed with clear direction and persistence, Adept was able to help establish the necessary guidelines (specification) to create the Sigelock hydrant. There are many lessons to be learned from Sigelock Systems. One such lesson is sheer persistence. Staying the course is imperative to the success of any design. All design efforts are a conglomeration of ideas, people and resources. Perfectly coordinating all these elements requires diligence and often some luck. Along with persistence, decisions need to be made. Throughout the design and developement process there are no shortages of decisions. Some of the most important judgments come early on when the desire to “get moving” is very strong. These decisions can tend to be a bit rushed, at times. One of my favorite engineering cliches is, “there is never time to do it right, but there is always time to do it over”. This may be true for the United States government, but not for the product developer. Did I say that it’s a wonderful time to be an engineer? The tools are nothing more than miraculous. I expect that this appreciation comes from the unique perspective of engineering from an era that went from the drawing board to the computer and beyond. The decision to leave the virtual world and enter the real world is similar to most engineering decisions. It is filled with trade offs, generally weighing the benefits from the risks. And, often the reason to stay virtual or go physical is to mitigate risk. Confused, you should be, because it’s not easy.